The 2016 Nissan Maxima has "4DSC" molded into the headlight and taillight lenses. It stands for "4-Door Sports Car," a throwback to the early 1990s when the 3rd-generation Maxima debuted. 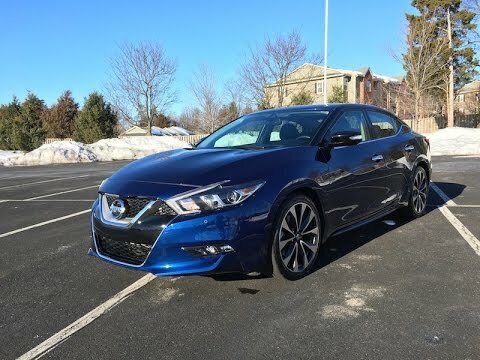 Nissan can call it whatever it wants, but in reality the new Maxima deftly straddles the line between entry-level luxury car and sports sedan. And that's no bad thing. Great horsepower and daringly unique interior designed by blue angels Pilots. I absolutely love my Nissan maxima. Designed by the blue angels, it gives me a thrill of power when behind the wheel. Throw it into sport mode and it flies down the road. It has made many long trips with me and my family and withstood 3 large dogs. The biggest issue with reliability is the radio sometimes cuts out due to it being satellite radio. The low profile it has does pose problems with speed bumps and steep driveways occasionally. If you keep up with the oil and tires, this car keeps going a while. I especially enjoy the driver assist notifications when changing lanes or coming too quickly on someone. The car actually brakes for you depending on the speed sensed by the computer! It also has smart cruise control that allows you to decelerate and accelerate According to the distance and speed of the car in front of you. Overall I would not skip out on the v6 for price. It is well worth the buy if you like to go fast and need a good commuter car. My Nissan is powerful and such a beautiful car with a lot of features. I love the performance of my maxima. I like that the newer models all come with navigation system and satellite radio. It is a very reliable car with a lot of power. The model I have is the 3. 5s and it comes with remote start. I hate that it does not come with the heated seats and turn signal on the mirrors but all the other models do. Everything inside is brand new. Since I bought the car I have never had a breakdown and is very comfortable inside with and air conditioner inside to regulate the temperature. Its stability is great with a very high center of gravity. I will always recommend any of my friends and family members to go in for nissan brand cars if a anytime they need to purchase a car.